In this article, we will attempt to address all these three concerns (they are essentially the same) and provide you with three insider tips to keep your 4H2s & clear your promotional exams safely. The cut-off points for the respective JCs are as follows. So on what basis are these cut-off points based on? 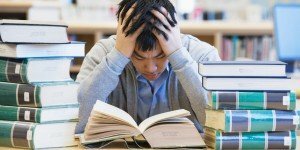 As a typical Singaporean brought up under our education system, it is not difficult to conclude that the cut-off points are determined mainly by ‘A’ level results. So it works like this – Students with good O level results will want to enrol to good reputable JCs that can secure them good grades into local universities. 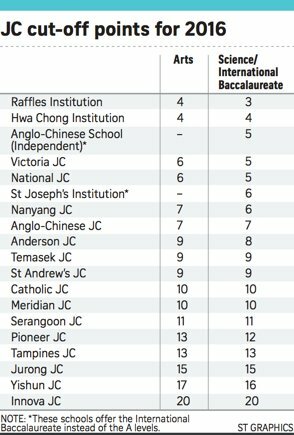 And since the ranking system is officially ‘scrapped’, the next best measurement is to look at each respective JC’s ‘A’ level results > the better the results, the greater the competition into these JCs and thus the lower cut-off points are determined. From both the micro & macro perspectives, you realise that it is surprisingly easy for you to flop your first year, especially if some schools are ‘incentivised’ to secure low cut-off points by preventing poor performing J1 students from promoting. So what happens when you flop your JC1 Promos? Say goodbye to any scholarship applications as the process is extremely competitive. You are in real danger of repeating your J1 (as covered earlier). One full year of repeating alone while your good pals proceed to J2. Now, having understood how easy is it to flop your first year, let’s uncover the 3 insider tips we have for you to excel in JC1! Many of our students who have repeated their first year before often expressed regret that they have spent way too much time in their CCA. We perfectly understand that there is SYF / ‘A’ Divisions, and the concept of YOLO. 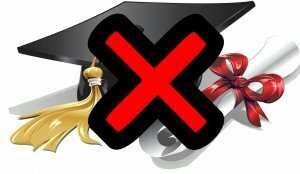 However, we also encourage students to strike a balance between their CCA and studies. Time management plays a huge role here – learning how to allocate precious time for your CCA and your studies is paramount. Try working out a Google calender to plan your schedule on how much time to allocate for CCA and how much time for revision! 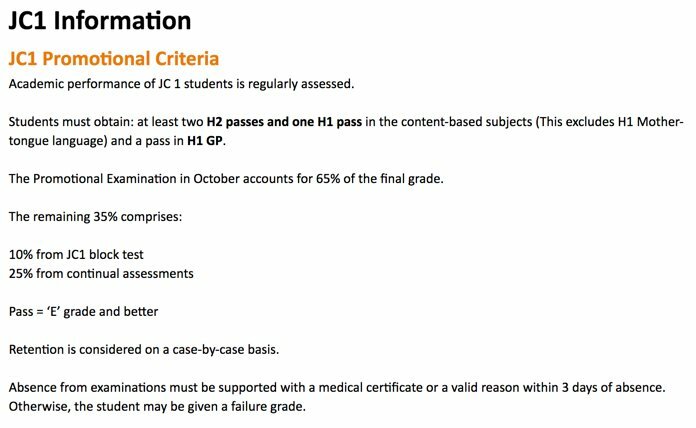 As we can see, this is a sample promotion criteria from NYJC and all schools’ promotion criteria are available on your school web. Different weights are assigned to various components, with the largest 65% being allocated to Promos. So this simply tells you: if you flop your Promos, it’s essentially ‘GG‘. To ‘game’ with this system, it is important to allocate time to revise for your Block Tests / CAs / Mid-Years and to at least secure a ‘Pass’ for all your subjects (especially GP!) By securing a ‘C’ or ‘D’ grade in these small assessments, even if you borderline fail your subjects, your previous grades will help you tremendously in pushing you to a ‘Pass’. Never give up on your minor assessments no matter how immaterial it may seem. Lastly, if you flop your Mid-Years / Block Tests / CTs & still ‘catch no ball’ of the subject, for example Econs, seek help! You need to arrange immediate consultations with your Econs school tutor(s) to clarify your doubts and figure out the areas you need work on specifically i.e Market Failure / Elasticity! It will be too late if you seek help around September as most of your tutor’s time slots will already be packed with other students. 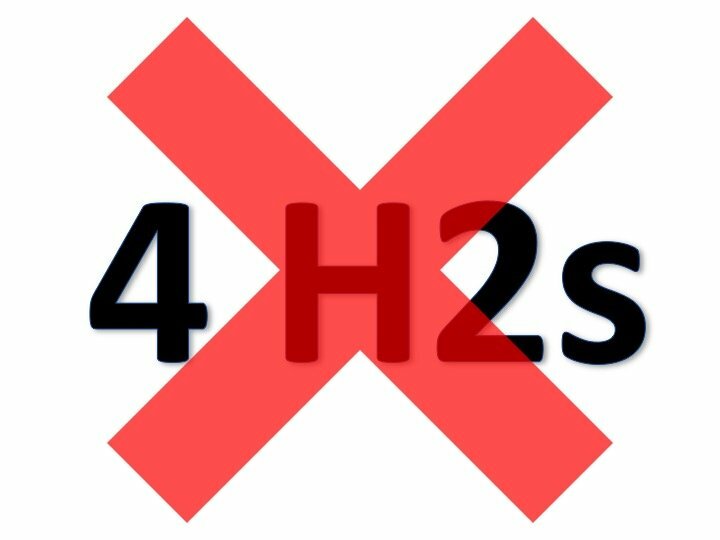 However, if your Econs tutor proves to be incompetent in his/her area of expertise and you would like to seek external help from us, we would like to extend our help to you with our money back guarantee JC1 H2 Programmes so that you can keep your 4H2s & promote with a peace of mind!